A lawyer had a question. What must I do to inherit eternal life? Certainly that is a question we would all like to ask of Jesus. Jesus turns the question back on the lawyer and asks him what is written in the law. The lawyer, without hesitation answers, “you shall love the Lord God with all your heart, soul and strength, and your neighbor as yourself.” Good answer, says Jesus. But the lawyer calls for clarification, “who exactly is my neighbor?” And then Jesus shares the story of the good Samaritan. It seems that a neighbor is anyone who is in need. And we are a neighbor to that person, when we show mercy…or in some scripture translations…kindness. That word, “kindness”, put a story in my mind. In fact I woke up in the middle of the night trying to remember the story. My foggy brain could only recall that it had to do with Nordstrom’s Department Store and the words to serve and be kind. “To serve and be kind” is something that we might expect to hear in church, not in the context of a department store. I quickly searched the internet and found the story in a piece by marketing expert Carl Galletti. When I used to teach marketing I used this Nordstrom’s story as an example. That was many years ago, but it is not a story one easily forgets. Here is an edited version of the story Mr. Galletti related. 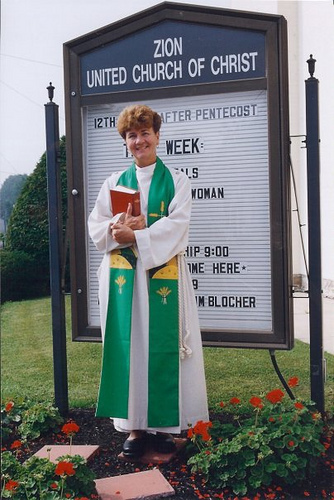 Reverend Carolyn Crawford was known throughout Southern California for her topical, powerful sermons. But speculation on what she would say was unusually high one particular week just after the holiday season. As was customary, each Monday the topic for the Sunday sermon was posted on a sign outside the church. This week it read: “The Gospel According to Nordstrom.” Members of the congregation were no strangers to upscale Nordstrom. They just couldn’t conceive of what a merchandising Mecca had to do with the Gospel and its lessons. The church was packed that Sunday. The hushed congregation awaited Reverend Crawford’s sermon. She began, as might a materialistic heathen, by evoking the bustling, luxurious atmosphere of a marbled Nordstrom store during the holiday season. She recounted the sensory delight permeating the store: the sight of abundant decorations; the sounds of holiday music expertly performed by an elegant, tuxedoed piano player; the aromas of potpourri and expensive perfume. Flocks of charmed shoppers swarmed in and out, laden with finely wrapped gifts to bring home. Suddenly, the shared atmosphere of revelry was shattered. A bag lady, hunched over, clad in torn clothes and filthy with stench, walked through the doors. Reverend Crawford was in the store and decided to follow her, certain that her inopportune presence would be taken care of promptly — as unwelcome as it was incongruous. The Reverend waited to intervene with security so that she could soften the blow to the woman’s dignity when asked nicely, but firmly, to leave. Yet her original interest in the interloper would soon change. Though Reverend Crawford saw the stark contrast of this woman to the gracious abundance of the store, Nordies (Nordstrom employees) must have seen something else. No one tried to stop the bag lady as she shuffled through the store. She reached the most elegant and pricey Special Occasions Department, where she was greeted warmly, professionally by a smartly attired saleswoman. The Reverend was incredulous. What did these people see? Reverend Crawford slipped into the fitting room to eavesdrop. She listened, astonished by what her ears saw. The salesperson’s responses to the customer were solicitous, not patronizing; respectful, not pitying. When the customer asked to try on evening dresses, the salesperson brought over one gown after another, asking for the customer’s most discriminating opinion. The customer inspected each gown, trying several on. With infinite patience as an hour slid away, the salesperson carefully evaluated which gowns she felt were the most flattering and appropriate for the customer. The bag lady decided she was finished. She left the fitting room, thanked the salesperson, and walked out of the Special Occasions Department. This woman looked different. Her head was held high, her gait seemed smooth and there was a new light in her eye. She had just experienced Nordstrom. Still sitting in the fitting room, Reverend Crawford was dumfounded. She got up and approached the Nordstrom saleswoman. Uncharacteristically at a loss for words, the Reverend simply asked why she had spent an hour with this bag lady, helping her try on thousand dollar gowns — at a store which measures employee’s sales per hour religiously! The pastor closed her sermon by asking the congregation, “Couldn’t we say the same thing about ourselves as churchgoers? As human beings? That we are here to serve and be kind?” In other words, the gospel according to Nordstrom’s is also the gospel according to Jesus. Jesus offers to us this parable as a way of illustrating this basic point: God loves us all extravagantly. That means God loves our neighbor as much as God loves us. That sounds simple—but do we really believe that? If it were easy to believe, Jesus would not have told this parable. Who is our neighbor? Anyone who needs kindness…in other words… everybody. Imagine that it is a member of, for instance, Alcaeda, laying in that ditch. Can we nonetheless serve and be kind? Jesus is applying a very hard and a very high standard. But this parable does not stop there. We must also imagine ourselves as the one who is laying in the ditch and receiving help from an Islamist extremist. This parable requires us to imagine someone who we despise to be a source of potential goodness? It cuts both ways. Jesus disregarded the neighborhood maps. Remember the things for which Jesus was criticized by the Pharisees…healing on the Sabbath, teaching and talking with women, and even touching the dead. When Jesus said to his disciples, love one another as I have loved you– that was a love that knew no boundaries. He drew new maps that were radically inclusive, based on love and not law. The priest and the levite were justified by the law in passing on by. The law forbade them from touching a corpse, and they feared the man was dead or that it was a trap. They had sufficient legal reason. So the law passed on by. Mercy stayed to help. Mercy stayed to serve and be kind. Some weeks ago we took a trip around Adams County to study the sites of the Underground Railroad. The Quakers were justified by the law in turning their backs on the escaped slaves. But these people feared God more than the law. They did not pass by, instead, mercy stayed to help a neighbor. We come back to the theme of justification that we pursued in our study of Galatians several weeks ago. When we try to justify ourselves, as did the lawyer, we put ourselves outside God’s grace. God sets our margins straight through grace. Eternal life begins for us each moment we live into that grace. The Spirit of God moved the Samaritan to serve and be kind. When the Samaritan reached into the ditch to help his neighbor, he was already living eternal life, then and there. That’s exactly what Jesus is saying. We live in a big neighborhood, with many neighbors. We have many opportunities to serve and be kind. Since we have an infinite number of ways to be a neighbor, we have an infinite number of opportunities to live eternal life, today. January 1, 1999: Galletti quotes the story from Betsy Sanders’ book, Fabled Service, which is about the Nordstrom’s customer service philosophy. Background for this discussion on social mapping is contained in Jerome Neyrey’s The Social World of Luke-Acts, Hendrickson Pub., ch. 10. This idea is expressed by James A. Wallace, in Feasting on the Word, Year C, vol 3, 241.